As astonishing as Hilde’s story is, Rita herself emerges as the central, fascinating character in this utterly unique account. 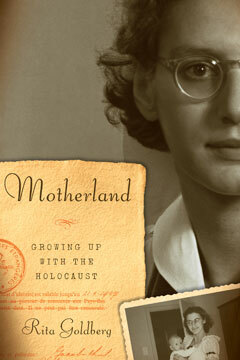 Proud of her mother and yet struggling to forge an identity in the shadow of such heroic accomplishments (in a family setting that included close relationships with the iconic Frank family), Goldberg offers a profound and unflinching look at the often wrenching family and interpersonal struggles of the children and grandchildren whose own lives are haunted by historic tragedy. Motherland is the culmination of a lifetime of reflection and a decade of research. It is an epic story of survival, adventure, and new life. The New York Times reviews Motherland: "At the heart of this engrossing memoir is her mother...The extraordinary tale is heroic. It strikes the reader as thoroughly romantic, even cinematic." Kirkus Reviews says: "Goldberg writes eloquently of the 'volcanic pressures' that shaped her family’s story and continue to haunt her own."